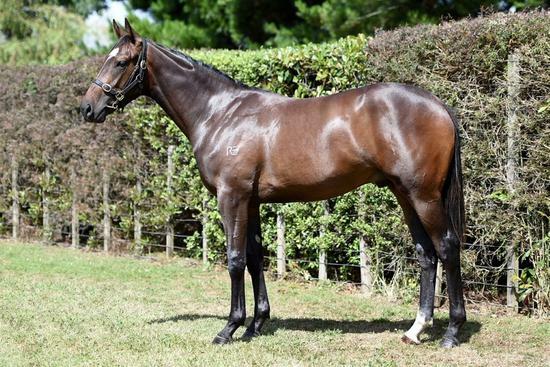 Introducing Lot 354 from the 2018 Karaka Sales in New Zealand. A strapping colt out of LYCRA LASS and by impressive sire DECLARATION OF WAR. DECLARATION OF WAR (USA) (Bay 2009-Stud Ire. 2014, Aust. 2014). 7 wins-2 at 2, Royal Ascot Queen Anne S., Gr.1. Half-brother to SW War Correspondent. Sire of 211 rnrs, 96 wnrs, 10 SW, inc. Olmedo (Longchamp Poule d'Essai des Poulains, Gr.1), Actress, Opry, Speed Franco, Uncle Benny, Assiro, Eirene, Full Moon, etc. His oldest Aust.-bred progeny are 3YOs and inc SW Vow and Declare (VRC TCL TV S., L), SP Weaponry and of Declarationofheart, Declares War, Vigor Winner, Winning Ways, etc. Think Cathy (f. by So You Think). Winner at 1600m in 2017-18 in Aust. Ankle Belle. 5 wins to 1300m, AJC Blair Athol H., 2d STC Winning Post Restaurant H., 3d AJC Bonecrusher H.
Lycra Lass. 7 wins. See above. So Great. 2 wins at 1650m, HKJC Financial Times Index 100 H., Kagoshima H., 2d HKJC Larch H., Yat Sin H., 3d HKJC Tsang Tai Uk H.
Manoloblahniks. 5 wins to 1400m, 2d BRC St John Entertainment H.
FERLAX (Pentire). 4 wins from 1200m to 1600m, A$411,000, VRC Australian Guineas, Gr.1, 2d MRC Memsie S., Gr.1. Sire. Suggestions. 3 wins at 1200m, 1400m, ARC Dunstan Rising Star Qualfifier H., 2d CJC Mid Winter Christmas June 24 H., 3d CJC Avon City Ford H., Otago RC KB Contractors H.
LEGGINGS (Tights). 9 wins. See above. Beechland (Taipan II). 3 wins at 2, Avondale JC Singapore H., 3d Levin RC Ryder S., L.Died at 3. LEADING ROLE (Darci Brahma). 3 wins-1 at 2-to 1550m, NZ$144,310, to 2018-19, WRC Wakefield Challenge S., Gr.2, Gavelhouse.com S., 2d Manawatu RC Dunstan Feeds Qualifier, Hawkes Bay Reliable Man Trophy, Marton JC H & T Agronomics H., 3d Manawatu Classic, Gr.3, Marton Cup, L, WRC Richardsonracing.co.nz 2YO S., Hawkes Bay Christmas at the Races H., 4th CJC Canterbury S., L.
BOOM 'N' ZOOM (Dash for Cash). 4 wins from 1400m to 2400m, A$292,942, Cranbourne Cup, L, MRC Zaidee's Rainbow Foundation Cup, Hyperno H., 2d VRC Roy Higgins Quality H., Hanan Displays H., 3d VRC Comedy King H., National Jockeys Trust H., MRC Slickpix Cup H., Special Dane H., St Razzle H., 4th Bendigo Cup, L.
Getty (Last Tycoon). 8 wins-1 at 2-to 1500m, A$107,555, M$1,038,900 in Aust. and Macau, Macau Doncaster H., AJC Kokoda 2YO H., STC Omni H., NRL Double Header H., Macau Waterford H., 2d STC Heritage S., L, 3d STC Arrowfield Stud H., Macau Calgary H., AJC Bankstown Recreational Club H.
BELLE MIRAAJ (Iffraaj). 5 wins-3 at 2-from 1000m to 1600m, NZ$142,125, Southland Guineas, L, Gore Guineas, L, Southland RC Coupland's Bakeries 2YO H., Otago RC NZB Pearl Series 2YO Bonus H., 3d New Zealand One Thousand Guineas, Gr.1, CJC Inglewood S., L, Warstep S., L, Ray Coupland S., L, 4th Otago RC Dunedin Guineas, L.